When the temperatures get chilly, the cozy sweaters and warm drinks take center stage. Here in Texas, we can only dream of snowy mornings and crackling fireplaces, but our sweltering weather doesn’t stop us from enjoying a hot cup of chai tea! What better way to enjoy all the aromas and flavors of fall in one soothing, renal friendly mug? Masala chai tea is derived from Indian roots where it has adapted into many forms. The classic method of preparation involves steeping whole spices, adding in milk and tea leaves, and then sweetening to your likening. The primary spices used involve cardamom, cinnamon, peppercorns, and star anise, to name a few. In addition, purist chai tea connoisseurs would recommend using loose leaf black tea of the ceylon variety. However, with modern grocery stores, bags or english breakfast tea can be just as tasty. Here at Kidney Grub we have taken this “fall in a cup” and modified it to be lower potassium and lower phosphorus, while still enjoying every sip. 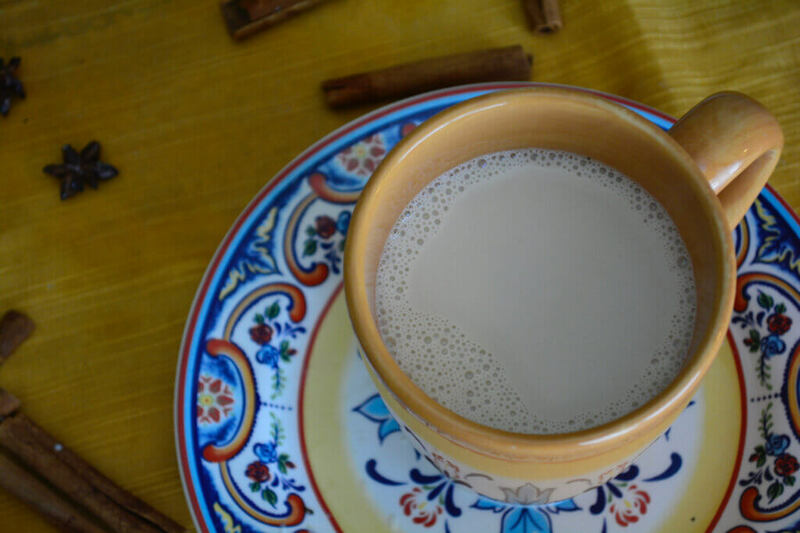 The key to making this recipe lower phosphorus and lower potassium was in how we substituted the milk Regular masala chai tea uses whole milk for its thick consistency. However, one cup prepared with whole milk will add 83 mg of phosphorus and 136 mg of potassium to your day. We thought we could create a better renal recipe! We experimented with *pecan milk and heavy whipping cream (yes, you read that right) in attempts to lower those two minerals. By using heavy whipping cream we were able to decrease the total amount of high phos/high potassium dairy product without sacrificing the creamy flavor so iconic of this chai tea. Our chai tea has 25 mg phos (58 mg less) and 85 mg potassium (51 mg less). Not only did this combination do the trick nutritionally, but it tasted just as good as the real thing! So grab your favorite blanket and snuggle up to this tasty rendition of fall in a cup, kidney friendly style! And maybe grab one of these tasty pumpkin spice meringues while you’re in the moment. *Of note, rice milk would work just as well as a substitute for this or any other renal diet recipe. I just happened to only have pecan Malk (my favorite) on hand. Hot beverage recipe for renal diet. 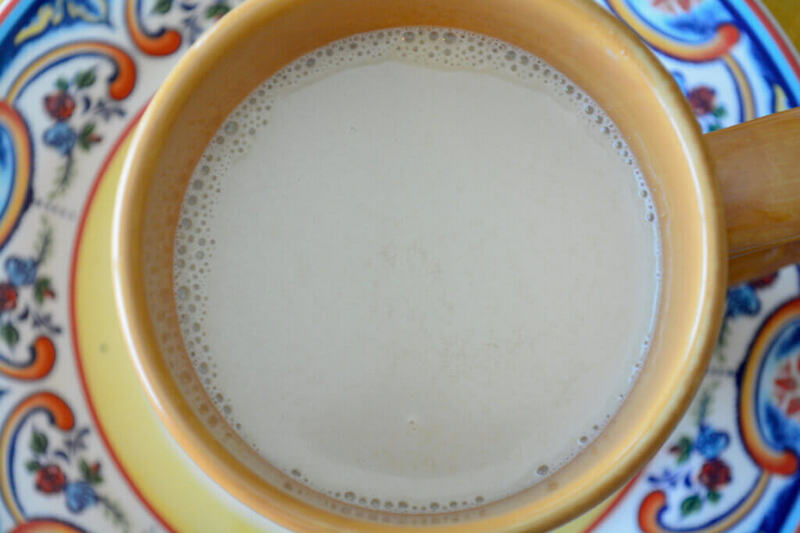 This creamy masala chai tea is kidney friendly and a perfect renal diet recipe to add to your kidney friendly menu. In a 2-qt saucepan, add spices to 1 cup of water. Bring to a boil; remove from heat; let steep for 5-20 minutes, depending on how strong a spice flavor you want. Add cream and rice milk to the water and spices Bring the cream and spice mixture just to a boil and remove from heat. Add the tea to the milk and let steep for 5 to 10 minutes to taste. (Option at this point – reheat to a simmer and remove from heat.) You can add sugar at this point, or serve without sugar and let people put the amount of sugar in they want. Traditionally, sugar is added before serving. Strain into a pot. Serve. Add sugar to taste. Rice milk will yield the lowest amount of phos and potassium but other milk alternatives such as pecan milk, soy milk, and almond milk can be appropriate. We happened to have pecan milk on hand for making this, but generally recommend rice milk.